Yonks back there was a series in the Mercury on the men hung and buried inside the steep walls of Leicester Prison. William Henry Palmer was among them…and he didn’t go quietly. 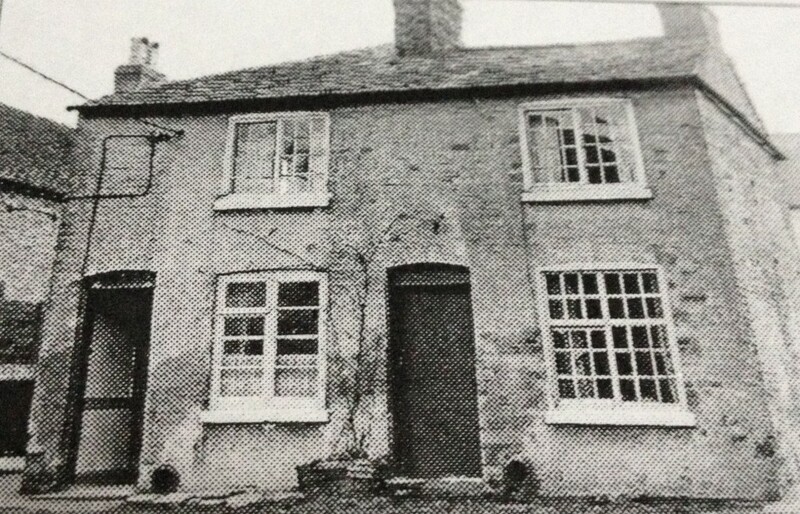 Ann Harris’s cottage in Voss Yard, at the back of the Black Horse, in Lutterworth Road, Walcote, south west Leicestershire. They’re supposed to do it with weary resignation; a sniff, a sorrowful glance, sometimes even with a full confession. That’s what convicted killers do on their way to the gallows, they follow the script. Nobody told William Henry Palmer. On July 19th, 1911 – when The Leicester Daily Mercury said his execution “passed off without a hitch” – they couldn’t have been more wrong. 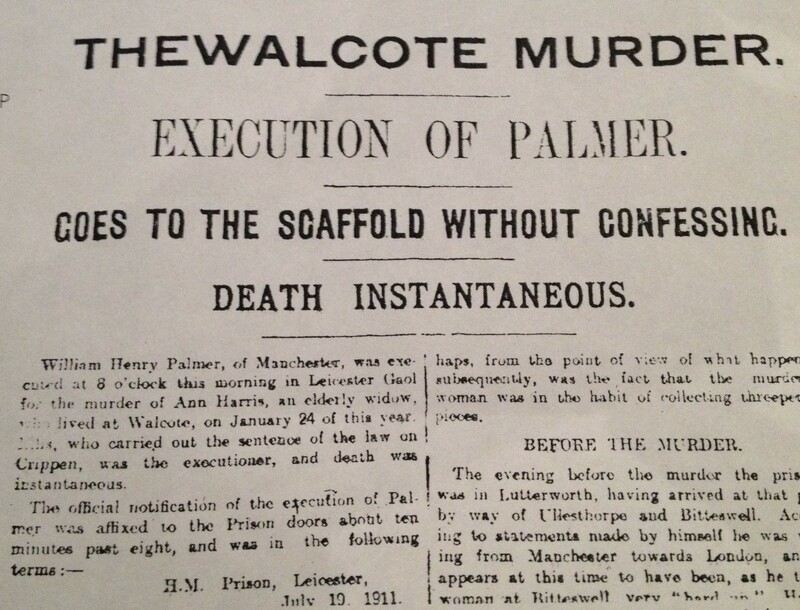 Palmer had been found guilty of wilful murder during his trial at Leicester Assizes on June 13. As Justice Pickford passed the death sentence, Palmer stood motionless, disbelieving. “The great, strong man remained unmoved and, when touched by a warder, quietly turned and picked up his steps down the stairs below,” according to the Mercury’s reporter in court that day. Palmer, a bulky 14 stone Mancunian, had pleaded his innocence to the murder of Ann Harris, an elderly widow in Walcote, but the jury wasn’t swayed, and on what many considered circumstantial evidence, Palmer was found guilty. The condemned man was taken to Leicester Prison, where a date was set for his execution. The sunny morning that was to be Palmer’s last began with the inmate mournful but seemingly at peace. A Wesleyan chaplain recited the Bible to the morose 50 year old as he sat hunched, head bowed in his cell. Having barely touched his breakfast, he blanked the churchman’s ministrations, never once admitting to strangling Ann Harris, and ransacking her home near Lutterworth on January 24th. When the executioner John Ellis arrived at 7.59am, Palmer was standing in the middle of his cell, glaring defiantly around. John Ellis, Britain’s executioner for 23 years. Stepping behind Palmer, Ellis took his left wrist to position it behind his back. It didn’t budge. Palmer, all 14 stones of rippling muscle, resisted the effort. The governor stepped forward in an attempt to pacify a now agitated Palmer. Ellis’s assistant then struggled to get Palmer’s straining right arm behind his back and, in the confusion, stepped in front of him, where Palmer – in 7lb hobnail boots – and yelling “I’ll get you!” let fly a vicious kick just missing him. In the chaos, four warders rushed in, but not even six men could overpower the might of a man in the fury of despair, his natural strength increased by the knowledge his death was surely around the corner. Palmer fought like a beast with his feet and hands, even attempting to bite the guards. As he was pulled to the ground, he was still raining blows on his captors, cursing like a maniac. Eventually, 10 prison officials – a writhing mass on the floor of the cramped cell – managed to hold him, pinning him on his front and tying his arms. “I took several hard knocks from him during the fight,” said Ellis, “but eventually we were able to carry out my suggestion to turn him over with his face to the floor. In this position I pinioned his arms, and then we were able to raise him to his feet. The stocky, red-faced convict was rushed from the cell, down a corridor and into the prison yard. “In that short distance to the scaffold, I decided to dispense with the pinioning of his legs when we got him on to the trap doors,” Ellis recalled. “Nor did I wait until he stood on the scaffold before pulling the white cap over his head. “We were still fully 10 yards away when I drew the cap from my pocket and slipped it over him. Whispering to his assistant to jump back as soon as Palmer was on the chalk mark on the gallows’ trap-doors, Ellis fixed the noose around the condemned man’s neck at lightning speed. Palmer’s feet had barely touched the floor when Ellis pulled the lever. “At the end of William Henry Palmer, we all breathed a heart-felt sigh of relief,” said Ellis. At precisely 8.10am, on July 19, 1911, the prison’s heavy iron door swung slowly open and a warden, carrying a single piece of paper, emerged from the gloom. Pinning the notice to the entrance, he left. A silent crowd of hundreds which had gathered outside surged forward. It was the official notification the jostling men and women were there for – that William Henry Palmer was dead. The Walcote murder; the notice in the Leicester Daily Mercury. The story of Palmer’s journey to the gallows began six months earlier at a widow’s cottage in the small and pretty Leicestershire village of Walcote. Ann Harris’s body was found by her sister on the kitchen floor at her home in Voss Yard on January 25. Ann was still wearing a nightdress. The house had been ransacked and cash had been taken, mostly in silver threepenny bits, which its owner liked to collect. Webbing had been pulled so tightly around Ann’s throat and yanked with such force it fractured her larynx. She also had several broken ribs, possibly caused by her killer kneeling on her chest as the ligature was tightened. One end of the webbing around Ann’s neck had been tightly wound onto a chair. Palmer, on route from Manchester to London, had been in Lutterworth that day. Ordinarily, he worked as a painter, but for some time had been hawking fish in his city. He was out of work in January and decided to go “on tramp”. A few days later he was in Leicestershire. It was claimed that he dressed in tatty clothes to give the impression he was worse off than he was and made a few pence telling his tale and selling the shoelaces he carried with him. One door he knocked on was opened by the Reverend CE Ward, the vicar of Bitteswell. He told Palmer that a fine strapping fellow such as he had no place on the road. The vicar gave him some money and received an assurance from Palmer that it would not be spent on drink. It was now dark and wintry outside and the next we hear of Palmer is him being refused lodging in Lutterworth, it having gone closing time, and then he asks directions for Northampton. The next sighting is made by Mrs Elizabeth Gibson, who lives in Voss Yard near Ann Harris. She observes a man crouching by the front door of a house in the yard striking matches. It was Mrs Gibson who picked Palmer out of a line up. “She declared emphatically that by the match-light she could tell that the man was Palmer; she thought at the time he was a visitor on legitimate business and that he was searching for the key-hole,” said John Ellis. Next morning Palmer was seen at Lutterworth Railway Station. He bought a ticket for London and from there went to Folkestone. He bought food at several places on route. His poverty of the previous day a distant memory. He pays in silver threepenny pieces. In Folkestone he asked at the railway station for directions to his sister in law’s house. On the way he stopped at a pub and drank heavily, and paid for the drinks of some local fishermen. By the time he left he was intoxicated and he’d spent 12 shillings, a considerable wedge in 1911. On questioning, the landlord of the pub remembered his customer’s generosity, but also his strange behaviour. Palmer appeared to be a in a state of nervous tension. Every time the pub door swung open he turned around sharply and gave the newcomer a long and anxious stare. The landlord suspected he was on the run from the police and contacted the old bill. During his four days in Folkestone, Palmer got rid of his tatty coat and bought a second hand replacement. It wasn’t long before the police, following his spending, caught up with him. When challenged for his name he said he was William Thompson and was as innocent of murder as “the man in the moon”. Detective Inspector Taylor of the Leicestershire Constabulary knew a porkie when he heard one. Palmer, once brought back to the county, heard his charges at Lutterworth Police Station. In court, Palmer’s defence was weak. Asked where he had obtained his money, Palmer said he found it in a field near Rushden, Northamptonshire. When the police took him there to show them the place he changed the venue to a field near Claybrooke Magna. He openly laughed at some witnesses in court. The only time he showed any emotion was when he was sentenced to death. The petition amounted to naught and John Ellis was directed to Leicester by the town’s Under Sheriff George Roylatt to be at Leicester prison on June 18th in preparation for the following day’s execution. 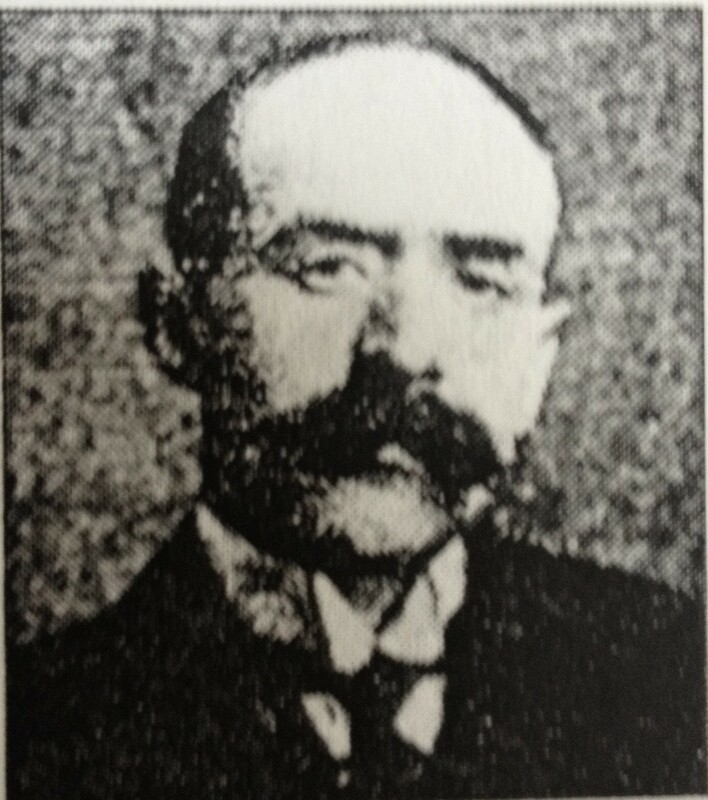 The prison doctor had supplied Ellis with Palmer’s physical statistics: Height 5ft 6″, weight 206lb. “I noted that his neck was flabby, which meant that it would be inadvisable to give him a long drop. Taking his neck and his weight into consideration, I decided to give him one of the shortest drops in my career – just 5ft 8″,” said Ellis. Palmer, meanwhile, vocally maintained his innocence. And while the evidence against Palmer was down to his new found wealth in silver 3ds and his sighting close to the murder location, it later emerged Palmer had spent his teenage years in South Africa…where he had murdered a farmer. Because of his age he escaped execution and instead served out a prison sentence. Another charge of murder was waiting to be pinned on him for the killing of a man in Manchester. By 7am on July 19, Ellis had done his final checks on his equipment and found everything to be just so. Palmer, he’d been told, had barely closed his eyes during the night. And then it was time to take him to the scaffold. “I’m innocent and I’m not going to let you murder me,” he growled back. This had to stop, thought Ellis, a man who liked a clean no-fuss execution – preferably done with a strong cup of tea first, and lasting no longer than 10 seconds. Finally and swiftly Palmer was bustled to the chalk mark on the trap-doors and the next second his neck was broken by the drop. “Almost every one of the prisoners I hanged went to their deaths calmly and unprotestingly, to the point where I took it for granted they would all conform to the rule. “The execution of Palmer was one of the really terrifying experiences of my career. I wrote about the murder back in 2005 for the Mercury, but this is a different article, with a lot more information. So there. I’m hoping to track down an image of Mr Palmer soonish.